Bordering Glacier National Park in the United States, Waterton Lakes provides a breathtaking extension to Glacier. Named for the Waterton Lakes, the deepest in the Canadian Rockies, Waterton Lakes National Park was dedicated to world peace in 1932. Straddling the continental divide in southern Alberta, the park is home to abundant flora and fauna and hosts many activities. Visit nature’s meeting place, a true sight to behold where windy prairies flow into imposing mountains. 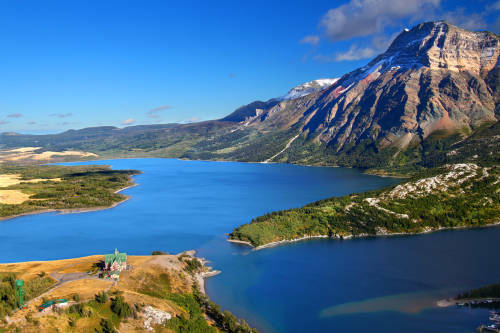 A place of such natural beauty makes the appearance of industry unlikely, but Waterton is home to the first oil well in western Canada, and a monument located between Cameron Creek and the Akamina Parkway is there for the viewing. Enjoy the beauty of the lakes by kayaking, swimming, scuba diving to the wreckage of a sunken ship, fishing, or windsurfing. Give back to the park by volunteering with the protect ecosystems program, or take a Red Rock adventure tour. Perhaps one of the most interesting tours available is the Beauty and the Beasts scavenger hunt. Visitors can pick up a checklist at a ranger’s station and then find each of the park’s animals one by one. A touch of the old world marks the distinctive atmosphere of the Prince of Wales Hotel. One of the most photographed hotels in the world, Prince of Wales Hotel literally stands above the rest in Waterton National Park. Built back in the 1920s by the same railroad tycoon, Louis Hill, who built the iconic Prince of Wales Hotel, the Northland Lodge was originally named the Carthew Lodge. He built the residence just down the hill from the Waterton township away from the hustle and bustle of town. To this day, the Northland Lodge remains a quiet, secluded and restful getaway with the same level of genuine care and quality of service that innkeepers of its past instilled. The Waterton Glacier Suites is the ideal accommodation for a mountain getaway to Waterton Lakes National Park. The Waterton Glacier Suites is open all year round and is centrally located in the townsite of Waterton, but, at the same time, is tucked away in a peaceful and tranquil section of the town. All suites are spacious, lavishly equipped with modern amenities, and feature sitting areas outside the rooms with lovely mountain views. The Waterton Glacier Suites is truly the place to stay in Waterton for a family vacation or a romantic excursion.